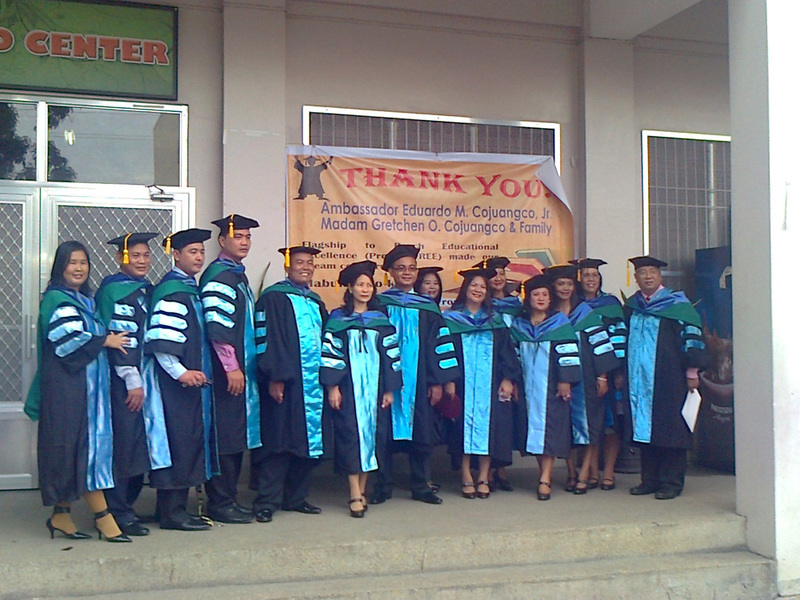 Last 22 June, some 680 teachers from various public schools in the province of Tarlac received their doctorates and masters degrees in the field of education through the Project Flagships to Reach Educational Excellence (Project FREE). The project is an initiative of the Eduardo Cojuangco Foundation and is under the auspices of the University of St. La Salle in cooperation with the Tarlac State University and the local government of the province of Tarlac. Aimed at improving the quality of education through improvements in the education of teachers, the project previously graduated a batch of 780 public school teachers also from Tarlac in June 2013. Faculty from Tarlac State University (TSU) and the University of St. La Salle (USLS) collaborated in mentoring the public school teachers of Tarlac who graduated from this program. On hand to witness the graduation rites were project sponsors, Ambassador Eduardo and Mrs. Gretchen Cojuangco; members of the local government of Tarlac led by Gov. Victor Yap and Congressman Henry Cojuangco; USLS officials led by Br. Raymundo Suplido FSC, Dr. Therese Jochico, Vice-Chancellor for Academics and Dr. Elsie Coscolluela, Project FREE Director; and key officials of the Department of Education led by graduation guest speaker, DepEd Secretary, Br. Armin Luistro FSC. Tarlac is the second province to have benefitted from Project FREE. The fourth district of Negros Occidental was the first to have benefitted from Project FREE in 2002. The Eduardo Cojuanco Foundation, in cooperation with Br. Gus Boquer, then president of University of St. La Salle in Bacolod, launched the project in Negros Occidental where 1,340 public school teachers were able to earn doctoral and masters degrees in education. Follow-up studies have shown marked improvements in the performance of students in public schools in national exams after their teachers underwent further studies.